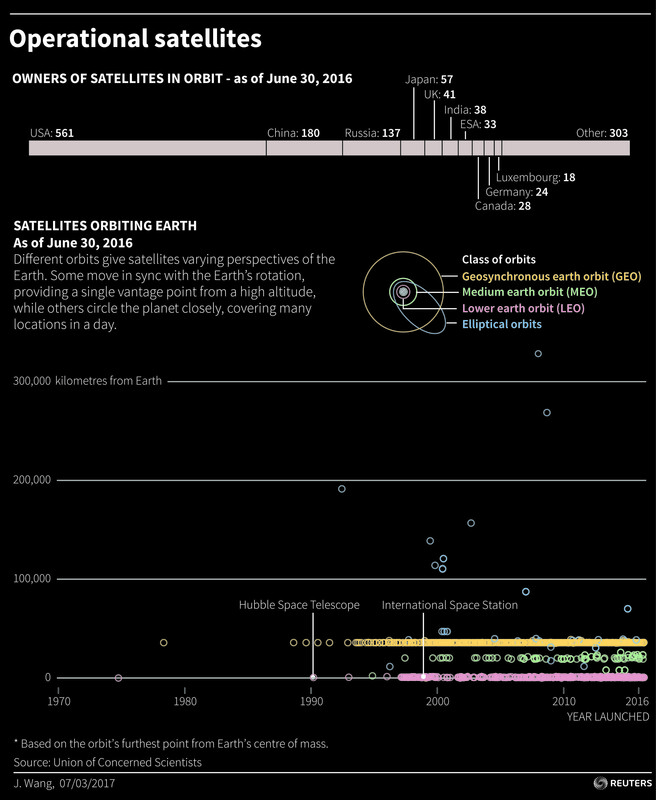 There are roughly 1,500 satellites orbiting Earth right now, providing a wide array of data and services that are critical to human societies. They contribute information that’s vital for the environment, education, food security, public health, water resource management, human rights, disaster relief and nuclear security. The Global Position System, for example, is estimated to have benefited the US economy by more than $55 billion in 2013 alone. Space-derived services not only improve the efficiency and effectiveness of many terrestrial activities but also provide much of the information and understanding needed to prevent and mitigate a variety of risks. At the same time, the field of space is experiencing rapid changes. There are a growing number of governments, companies, and other entities starting to get involved in space, and some are exploring new types of activities and capabilities that could in the future bring massive and new benefits. More than 60 countries currently operate at least one satellite and an estimated 16,000 new satellites are planned for launch in the next decade. The most recent countries to put a satellite in orbit include Laos, Ghana, Finland, Latvia and Slovakia. Even US high schools have put up small CubeSats. This growth is primarily driven by the commoditization of space technology and increased access to capital, which has lowered the barriers to participate in space activities. The growth in space actors primarily comes from two areas: states and start-up companies. Although nearly all countries rely on space capabilities in some capacity, most have historically relied on services provided by other states. Today, an increasing number of nations are building and operating their own satellites for a variety of reasons, including national pride, to foster science, technology, engineering and mathematics (STEM) education, or to kick-start their own commercial space sector. At the same time, billions of dollars in public and private capital are flowing into dozens of space start-up companies, including $2.8 billion in 2016 and almost $8 billion since 2012. Some of these start-ups are bringing new innovation and expanded capabilities to existing commercial space sectors, such as communications and remote sensing. Others are trying to build commercial markets in launch services, human spaceflight and exploration, which historically have been the domains of governments. Still more are looking to break new ground and develop space capabilities that have only been dreamed about in the past, such as mining asteroids. The expansion in commercial space activities is forcing governments to rethink existing national policy and regulatory mechanisms for how they provide oversight of these non-governmental actors. The increased availability of space technology and capabilities has both advantages and disadvantages. On the positive side, it leads to a great increase in innovation, lower costs and greater access to beneficial satellite services for everyone. However, the growth and diversification of space activities and the influx of new actors has the potential to exacerbate many of the current challenges to the long-term sustainable use of space, including: on-orbit crowding, radio-frequency interference, the proliferation of space debris and the chances of an incident in space sparking or escalating geopolitical tensions and conflict on Earth. Countdown: What will 2030's new space economy look like? There are already a few examples of initiatives that are trying to address these issues. The US provides warnings of close approaches between satellites and other space objects to every satellite operator in the world, free of charge. The Secure World Foundation, a US-based, non-profit organization dedicated to the long-term sustainability of space, has published a Handbook for New Actors in Space that provides an overview of the fundamental principles, laws, policies, norms and operational practices for peaceful, safe, and responsible activities in space. Meanwhile, the UN, through its Committee on the Peaceful Uses of Outer Space (COPUOS), is also developing a set of best practice guidelines for the long-term sustainability of space activities. An initial set of 12 guidelines were approved in June 2016 by all 84 member states of COPUOS, and additional guidelines are expected by the end of 2018. Yet there is still much more work to do. The expansion and innovation in humanity’s use of space hold huge promise for improving lives around the world, but only if we, the global space community, can find ways to do so sustainably. Governments, industry, and civil society must work together to develop and implement measures to improve space governance and ensure that space development lives up to its promise. This blog is part of a series of posts by the World Economic Forum’s Global Future Council on Space Technologies. The series will focus on the future and importance of space for governments, business, society, and the individual.